NASA Astronaut Sunita Williams Stays In Orbit With SpaceX And Boeing Sunita Williams was the second female commander of the International Space Station. Now, she says her new job working with private companies to develop space technologies feels like a new frontier. 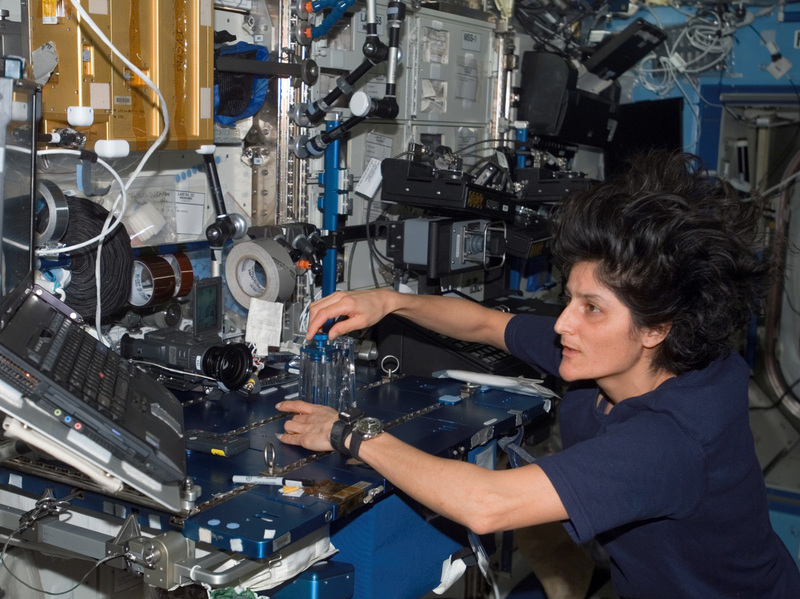 Sunita Williams conducts routine maintenance during a stint aboard the International Space Station. Nowadays, the astronaut helps Boeing and SpaceX develop private spacecraft. Sunita Williams wasn't the kind of kid who wanted to be an astronaut when she grew up. She wanted to be a veterinarian. But she managed to achieve the former kid's dream job, anyway. Williams, 52, has completed two missions to the International Space Station, spending over 11 months orbiting the Earth in total. She's also noted for her total cumulative spacewalk time, having spent 50 hours and 40 minutes outside the International Space Station. She has continued her career in space on Earth as a member of NASA's Commercial Crew Transportation Capability (CCtCap), a group of veteran astronauts that works with privately held companies like Space X and Boeing to develop spacecraft. Part of her job is to verify that the companies' spacecraft can launch, maneuver in orbit and dock to stationary spacecraft like the ISS. NASA announced the CCtCap in 2015 as part of "the Obama Administration's plan to partner with U.S. industry to transport astronauts to space, create good-paying American jobs and end the nation's sole reliance on Russia for space travel." "This is really different from my old job, you know," Williams said. When she became an astronaut, the shuttle was already laid out. "It was all documented and out there, and [I] went through classes to understand all the systems," she said. "The plan was there, and you had to get this, this and this done before you could go fly out in space." Her path to the stars began with the Navy. Williams graduated from the U.S. Naval Academy with a bachelor's degree in physical science in 1987. After graduation, she was designated a Basic Diving Officer at the Naval Coastal System Command. She was designated a naval aviator in 1989 and went on to log more than 3,000 flight hours in more than 30 different aircraft. Williams received a master's degree in engineering management from the Florida Institute of Technology in 1995. In 1997, she, along with more than 100 other people, applied for a position as an astronaut. After more than a year of interviewing, she was selected by NASA in June 1998. Williams spent five months training for her first mission, and received intensive instruction in shuttle and ISS systems, and water and wilderness survival techniques. Williams also spent nine days underwater in NASA's undersea Aquarius laboratory. Williams took her first ride into space on Dec. 9, 2006, aboard the STS-116. "We were hootin' and hollering," Williams said of her first takeoff. "It is like the best roller coaster ride you've ever been on." "You take your gloves off, your gloves start to float," she recalled. "It's a whole different mindset. It's pretty spectacular." Williams served as Expedition 14/15's flight engineer and returned to Earth on June 22, 2007. On July 14, 2012, Williams returned to the ISS as part of Expedition 32/33 to conduct general research abroad the orbiting laboratory. She returned to Earth on Nov. 18, 2012. For Williams, every day at the International Space Station was different. "One day you might be cleaning the toilet, next day you might be doing some potentially Nobel Prize-winning science," she said. Williams says that during her two long stays aboard the ISS, she and her fellow crew members worked to keep a normal earthbound schedule and a sense of regularity to their days. "We get up at 6 o' clock or so, and there's daily planning conferences with control centers all over the world," she said. 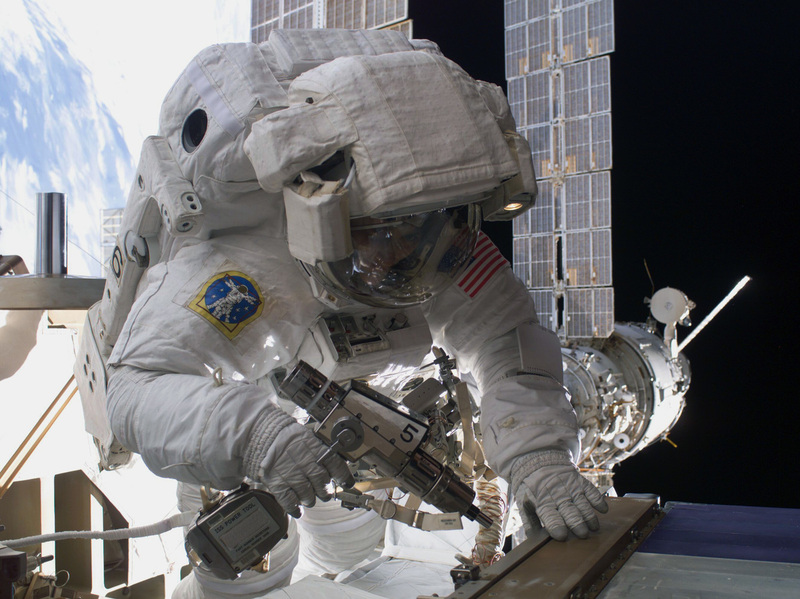 Sunita Williams performs maintenance during a spacewalk outside the International Space Station in 2012. The astronaut has spent more than 50 hours "spacewalking." On Fridays, the astronauts would indulge in films from both Russia and the United States. Williams recalled that Groundhog Day was a favorite, given how repetitive the days aboard the ISS could feel. By the time she returned permanently to Earth in 2012, she had spent 322 total days in space — at the time, her combined stints were the longest on record for female astronauts. Since the discontinuation of NASA's space shuttle program in 2011, U.S. astronauts have had to rely on Russian shuttles to get into orbit — which Williams and her internationally sourced crew did during her 2012 mission. Compared to its heyday, publicly funded space travel in the U.S. was no longer a hugely viable option for those wishing to explore space — but as it turned out, private space travel was. Privately funded companies such as Space X and Boeing have made it their business over the past two decades to take over some parts of space travel from NASA. That business is booming — just last month, Space X successfully launched the most powerful rocket in decades. The launch was one small step toward Space X founder Elon Musk's ultimate vision: a colony of a million people living on Mars. In order to achieve those otherworldly ambitions, Space X and other private companies need the right kind of people working for them — people like Williams. The space machinery of private companies that Williams now supports are still works-in-progress. "They don't really have training systems established for them yet," she said. "We're sort of creating that right now with the folks at the companies." That means deciding what things are important for astronauts to know — "classic things like getting in your seat, reach[ing] all the controls," she said. "We're establishing all that with the companies right now." Her contributions have helped to build the Boeing CST-100 Starliner and SpaceX Dragon. Williams' work has also provided transportation for NASA astronauts to her old base, the ISS. And more broadly, Williams says that private space companies just want to keep learning and exploring. Though she works with familiar components and protocols, she says her new job feels like a new frontier. Williams hopes to revisit the ISS in the future on the very spacecraft she's helping to develop. "We want to keep finding the next thing," she said. "And this type of exploration with a common goal, a common good of looking at something farther and bigger than ourselves. It totally opens the door for collaboration and cooperation for people from all over the world." NPR&#x27;s Noor Wazwaz helped to produce this story for broadcast. A previous version of the Web story said Sunita Williams holds the record for total cumulative spacewalk time by a female astronaut. In fact, though she once held the record, that record has been surpassed.